Is Mega Millions' Record $1.6+ Billion Jackpot Worth $2? Are you thinking about buying a 1 in 302,575,350 chance to win a $1.6+ billion jackpot in the Mega Millions lottery today? Yes, that headline is correct: The Mega Millions jackpot is at $1.6 billion. With a B. 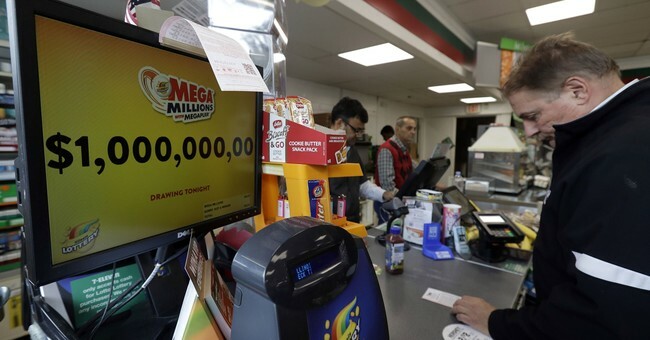 The estimated cash option for a $1.6 billion jackpot — should a winner choose to take a one-time lump sum payment instead of annual payouts over 30 years — is about $905 million, according to Mega Millions officials. That's quite a lot of money, which will very likely entice a lot of Americans who normally don't consider playing the lottery into the mix for the grand prize in tonight's Mega Millions lottery drawing. To give you an idea of how stiff the competition will be in the Tuesday evening drawing, about 57% (or 172,467,950) of the 302,575,350 possible combinations of numbers that could be played in the Friday, 19 October 2018 drawing were played, when only a $1 billion jackpot was up for grabs. And now with an even bigger prize at stake, it would be a safe bet that an even larger percentage of all the possible number combinations will be played in the next drawing. But is the jackpot large enough to be worth your $2.00 to buy one chance to pick win the jackpot? Or to be worth sharing in winning the jackpot if there is more than one player who has also picked the winning numbers? In the tool, we've set the federal income tax rate to 37%, which is the maximum income tax rate that applies for 2018. We've set the state and local income tax rates to 0%, which you'll need to change if you live in a state and/or city and/or county that taxes lottery winnings. Running the default numbers we've entered, we find that the projected jackpot of $1.6+ billion is greater than the "magic" jackpot of $961 million that would make the Mega Millions lottery worth paying $2 for a ticket to play today. At the same time, because the jackpot is currently less than $1.82 billion (double the tool's magic jackpot figure), it's not worth buying a second ticket to play, nor is it at a level that would make it worth paying $2 to play only to have to share the grand prize with one or more additional winners who might pick the same winning numbers. On the 1 in 302,575,350 chance that you do win, you'll have some decisions to make about how you want to collect your winnings. Be sure to check out this article to consider the relative merits of either taking the lump sum or of taking the annuity payout over 30 years.